There are many more buyers than sellers intending to be active in the New Zealand property market in the next 12 months. This was a major finding in research released today by realestate.co.nz, the country’s largest property listing site with the most residential listings for sale. Commissioned by realestate.co.nz, the Horizon Research survey- examined buyer and seller intention to participate in the property market in the near future. The research results show that 6.4 per cent of the adults 18 years or over surveyed are definitely looking to buy in the next 12 months, but only 2.8 per cent of people stated they are definitely looking to sell in that same period, says realestate.co.nz spokesperson Vanessa Taylor. This equates to a shortage of around 3.6 per cent of homes across the New Zealand marketplace, representing a significant number of properties currently not on the market, she says. "Not surprisingly, the biggest pressure is evident in Auckland," says Vanessa. The research shows that in the Auckland Council (super city) catchment, those who said they were definitely looking to buy lifted to 9.5 per cent (from 6.9 per cent in November 2017). However, those who intended to sell fell from 4.3 per cent to 2.6 per cent in the same period. "This represents a widening gap between definite buyers and definite sellers. "In November the shortfall between definite buyers and definite sellers represented around 9,000 homes. "With more buyers saying they want to get into the market, the shortfall in the number of homes that would be required to meet that stated demand has widened to around 32,700," says Vanessa Taylor. Of the six local government areas identified in the Horizon Research survey, only Tauranga City had more sellers (3.9 per cent) than buyers (1.0 per cent) intending to be active in the next 12 months. In Christchurch City there was a significant gap between buyer and seller intention, with 15.5 per cent definitely looking to buy in the next 12 months and 4.0 per cent definitely looking to sell. 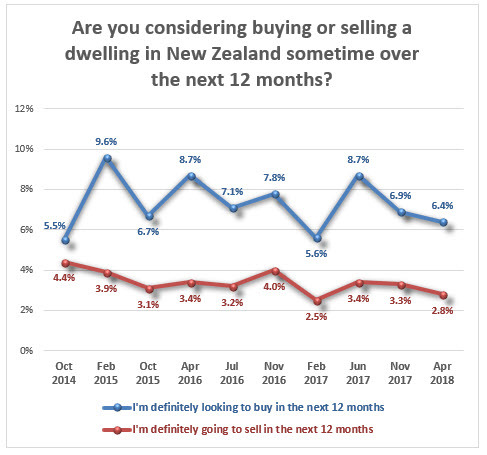 The research from Horizon shows the buying and selling intentions of New Zealanders in the next 12 months. Real time statistics from realestate.co.nz show the current market nationally is relatively stable, says Vanessa Taylor. New listings are slightly down compared to May 2017 (a 0.3 per cent decrease) and overall, total housing stock is marginally up one per cent (24,477) compared to May 2017. The Auckland region pulled down the overall national number of new listings with a 4.4 per cent fall compared with the same period last year, but this was balanced by a lift in new listings in 13 of the 19 regions. The average asking price for a New Zealand home is $648,218 representing a 0.4 per cent decrease on April 2018. "It paints a picture of more choice and stable pricing in modest terms," says Vanessa Taylor. "We are entering the winter period and typically the market starts to go quiet, but people still buy and sell property. The winter months are typically slower with less volume than the summer months, which gives buyers and sellers more time to consider opportunities," she says. While asking prices were relatively static nationally, all time average asking price highs were recorded in five regions in May. New listings increase in 13 of 19 regions - ski regions "hot"
The Auckland region dragged down the national new listing average with a 4.4 per cent drop compared with the same period last year. The total number of new listings in May stood at 3,528. "Two of the three "hottest" new listing regions were skiing meccas", says Vanessa Taylor. Central North Island led the country with an 18.7 percent increase in new listings (146), followed by the Hawke’s Bay region (up 14.9 per cent to 332) and Central Otago/Lakes (up 11.1 per cent to 160). "With the ski season looming it’s natural that sellers are looking to capitalise," she says. "Interestingly, while average asking prices were up 6.7 per cent in the Central North Island, they fell 4.4 per cent in Central Lakes/Otago."